In May, 1995 ZetaTalk stated that Crop Failure would occur due to erratic weather giving the wrong signals to plants, where they would think spring had come early, causing worldwide crop failures. As we described earlier, going into the cataclysms the weather will become unpredictable, with torrential rainstorms where not expected, and droughts likewise where not expected. Extremes of temperature will be experienced. Unusually warm winters, where the trees and shrubs will start to bud, thinking spring, and then be subjected to frost. Similarly, frosts will come late in the spring, almost into summer, killing the buds which have already put forth their tender shoots. During the years coming close to the time of the reappearance of Planet X, the giant comet, all parts of the world will experience extremes. Of course, leading up to the cataclysms, not all produce will fail. Greenhouse crops will come through. Backyard gardens, tendered carefully by watchful eyes, will survive. But the large cash crops that supply crowded population centers will find little to market, and the prices will go up accordingly. Lands used to regular rains, now suffering droughts, may find these droughts turning their land into deserts. Rain forests may fear being washed away as rain comes not only more often but with a greater load of water. Drought or deluge, there will be few places on Earth not affected by one of these extremes, and all of this affects the success of crops. Starting in January 1998, reports of such crop failures began coming in, but as the Shortage TOPIC shows, this did indeed increase exponentially in 2000. By late 2002, a UN Report documented the extent as worldwide, devastating, and due to weather related problems and reports in 2003 and 2004 showed this not abating. Worldwide, food stores are shrinking. In 2006, heat waves and drought affecting the US and Canada and Australia, and heat in Europe, devastated crops and livestock. By 2007, the fact that food stocks were depleated was admitted. By 2008, the price of grains was forcing starvation on almost half the world's population. In 2009, Global Research reported that crops around the world were expected to be decimated by 30-40% in some cases, the major food producing countries the worst hit by drought. To understand the depth of the food Catastrophe that faces the world this year, consider the graphic below depicting countries by USD value of their agricultural output, as of 2006. 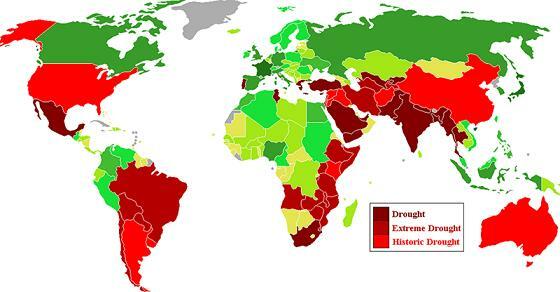 Now, consider the same graphic with the countries experiencing droughts highlighted. The countries that make up two thirds of the world's agricultural output are experiencing drought conditions. Whether you watch a video of the drought in China, Australia, Africa, South America, or the US , the scene will be the same: misery, ruined crop, and dying cattle. The drought in Northern China, the worst in 50 years, is worsening, and summer harvest is now threatened. The area of affected crops has expanded to 161 million mu (was 141 million last week), and 4.37 million people and 2.1 million livestock are facing drinking water shortage. The scarcity of rain in some parts of the north and central provinces is the worst in recorded history. The drought which started in November threatens over half the wheat crop in eight provinces - Hebei, Shanxi, Anhui, Jiangsu, Henan, Shandong, Shaanxi and Gansu. 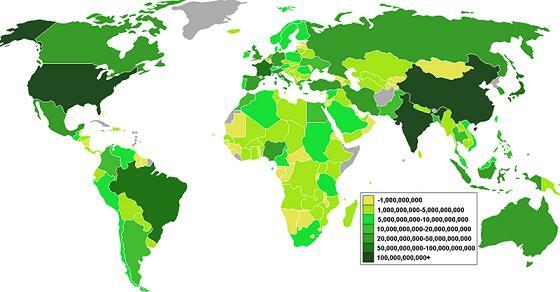 China produces 18% of the world's grain each year. Australia has been experiencing an unrelenting drought since 2004, and 41 percent of Australia's agriculture continues to suffer from the worst drought in 117 years of record-keeping. The drought has been so severe that rivers stopped flowing, lakes turned toxic, and farmers abandoned their land in frustration. The Murray River stopped flowing at its terminal point, and its mouth has closed up. Australia's lower lakes are evaporating, and they are now a meter (3.2 feet) below sea level. If these lakes evaporate any further, the soil and the mud system below the water is going to be exposed to the air. The mud will then acidify, releasing sulfuric acid and a whole range of heavy metals. After this occurs, those lower lake systems will essentially become a toxic swamp which will never be able to be recovered. The Australian government's only options to prevent this are to allow salt water in, creating a dead sea, or to pray for rain. California is facing its worst drought in recorded history . The drought is predicted to be the most severe in modern times, worse than those in 1977 and 1991. Thousands of acres of row crops already have been fallowed, with more to follow. The snowpack in the Northern Sierra, home to some of the state's most important reservoirs, proved to be just 49 percent of average. Water agencies throughout the state are scrambling to adopt conservation mandates. The Texan drought is reaching historic proportion . Dry conditions near Austin and San Antonio have been exceeded only once before - the drought of 1917 - 18. 88 percent of Texas is experiencing abnormally dry conditions, and 18 percent of the state is in either extreme or exceptional drought conditions. The drought areas have been expanding almost every month. Conditions in Texas are so bad cattle are keeling over in parched pastures and dying. Lack of rainfall has left pastures barren, and cattle producers have resorted to feeding animals hay. Irreversible damage has been done to winter wheat crops in Texas. Both short and long-term forecasts don't call for much rain at all, which means the Texas drought is set to get worse. The worst drought in half a century has turned Argentina's once-fertile soil to dust and pushed the country into a state of emergency. Cow carcasses litter the prairie fields, and sun-scorched soy plants wither under the South American summer sun. Argentina's food production is set to go down a minimum of 50 percent, maybe more. The country's wheat yield for 2009 will be 8.7 million metric tons, down from 16.3 million in 2008. Concern with domestic shortages (domestic wheat consumption being approximately 6.7 million metric ton), Argentina has granted no new export applications since mid January . Brazil has cut its outlook for the crops and will do so again after assessing damage to plants from desiccation in drought-stricken regions. Brazil is the world's second-biggest exporter of soybeans and third-largest for corn. Rice prices jumped 30 per cent to an all-time high on Thursday, raising fears of fresh outbreaks of social unrest across Asia where the grain is a staple food for more than 2.5bn people. The increase came after Egypt, a leading exporter, imposed a formal ban on selling rice abroad to keep local prices down, and the Philippines announced plans for a major purchase of the grain in the international market to boost supplies. Global rice stocks are at their lowest since 1976. While prices of wheat, corn and other agricultural commodities have surged since late 2006, the increase in rice prices only started in January. The Philippines, the world's largest buyer of the grain, said on Thursday it wanted to purchase 500,000 tonnes after it failed to buy a similar amount earlier this month. It is struggling to import 1.8m-2.1m tonnes to cover a production shortfall and on Thursday confirmed it would tap emergency stocks maintained by Vietnam and Thailand. Rice is also a staple in Africa, particularly for small countries such as Cameroon, Burkina Faso and Senegal that have already suffered social unrest because of high food prices. Thai rice, a global benchmark, was quoted on Thursday at $760 a tonne, up about 30 per cent from the previous daily quote of about $580 a tonne, according to Reuters data. Some traders, however, said the daily jump was not as steep, adding that Thai rice had already traded at about $700 a tonne this week. The United Nation's agency responsible for relieving hunger is drawing up plans to ration food aid in response to the spiralling cost of agricultural commodities. The World Food Programme is holding crisis talks to decide what aid to halt if new donations do not arrive in the short term. WFP officials hope the cuts can be avoided, but warned that the agency's budget requirements were rising by several million dollars a week because of climbing food prices. The WFP crisis talks come as the body sees the emergence of a "new area of hunger" in developing countries where even middle-class, urban people are being "priced out of the food market" because of rising food prices. The warning suggests that the price jump in agricultural commodities - such as wheat, corn, rice and soyabeans - is having a wider impact than thought, hitting countries that have previously largely escaped hunger. In response to increasing food prices, Egypt has widened its food rationing system for the first time in two decades while Pakistan has reintroduced a ration card system that was abandoned in the mid-1980s. Countries such as China and Russia are imposing price controls while others, such as Argentina and Vietnam, are enforcing foreign sales taxes or export bans. Importing countries are lowering their tariffs. The risks of food riots and malnutrition will surge in the next two years as the global supply of grain comes under more pressure than at any time in 50 years, according to one of the world's leading agricultural researchers. "Demand is running away. The world has been consuming more than it produces for five years now. Stocks of grain - of rice, wheat and maize - are down at levels not seen since the early 80s," said von Braun, whose organization is the world's largest alliance of agricultural researchers, economists, and policy experts. So far, crises have been averted because states have eaten into national stocks, but this could be set to change because China, in particular, has run down its supplies. Added to this are the pressures caused by global warming, which have been blamed for the droughts that damaged crops in Australia this year. In an "unforeseen and unprecedented" shift, the world food supply is dwindling rapidly and food prices are soaring to historic levels, the top food and agriculture official of the United Nations warned. The changes created "a very serious risk that fewer people will be able to get food," particularly in the developing world, said Jacques Diouf, head of the UN Food and Agriculture Organization. Reserves of cereals are severely depleted, FAO records show. World wheat stores declined 11 percent this year, to the lowest level since 1980. That corresponds to 12 weeks of the world's total consumption - much less than the average of 18 weeks consumption in storage during the period 2000-2005. There are only 8 weeks of corn left, down from 11 weeks in the earlier period. A heat wave baking California since mid July has killed 25,000 cattle and 700,000 fowl, prompting emergency measures and crippling the sector for months to come. Central California between Bakersfield and Redding is home to approximately 2.5 million cattle. Roughly 25,000 died because of the triple-digit temperatures since July 14. Milk production in central California is also down. Tulare-based Land O' Lakes Creamery normally produces 1.6 million gallons (6.0 million liters) of milk daily. The company has been reporting losses of 400,000 gallons (1.1 million liters) a day. High temperatures mean vegetables are maturing faster than farmers can pick and package them, an agricultural body has warned. The extreme heat has struck down crops across Europe. In Poland and Hungary some crops are expected to be 40% below normal yields, the Association of European Fruit and Vegetable Processing Industries warned. It said the very hot weather was creating a short picking season. In the UK the Processed Vegetable Growers' Association (PVGA) predicted that yields of peas, broad beans, cauliflower and spinach could drop by 20%. Fields of wheat, durum and barley in the Dakotas this dry summer will never end up as pasta, bread or beer. What is left of the stifled crops has been salvaged to feed livestock struggling on pastures where hot winds blow clouds of dirt from dried-out ponds. More than 60 percent of the United States now has abnormally dry or drought conditions, stretching from Georgia to Arizona and across the north through the Dakotas, Minnesota, Montana and Wisconsin, said Mark Svoboda, a climatologist for the National Drought Mitigation Center at the University of Nebraska at Lincoln. The latest figures from the weather bureau in Western Australia confirm Perth is having its driest year on record. The state's capital has recorded only 215.6 millimetres of rain for the seven months to July. The previous record low for the same period was 304.5 millimetres in 1940. Bureau spokesman Neil Bennett says so far this year the rainfall is more than 300 millimetres below average. Illinois agriculture officials say unusually mild weather with soaking rains may send the wrong message on winter wheat dormancy.